Welcome to the five hundred and thirty-first of my blog interviews with novelists, poets, short story authors, biographers, agents, publishers and more. Today’s is with non-fiction author Jonathan Ledwidge. A list of interviewees (blogged and scheduled) can be found here. If you like what you read, please do go and investigate further. Morgen: Hello, Jonathan. Please tell us something about yourself, where you’re based, and how you came to be a writer. Jonathan: I was born in London but grew up in Jamaica where my parents are from. I have been living in the UK since 1986 and while I have spent most of my working life working for banks my true passions are history, politics and people. Jonathan: All my writings are based on my deep-seated beliefs and what I learned about history, politics and people. I always felt that I needed to express what was inside me and for a long time I struggled in terms of determining how exactly to express myself. I finally decided that I was so upset with the Bush Administration’s war on terror that I was going to write about American politics which I have been following for many years—when you live in Jamaica you cannot escape it. I then realised that I did not have the inside knowledge to write something factual. That was how I came to write a book of historical fiction which looked at the world not as how the media and the politicians said it was, but in the way I viewed it. Since then however, my other books have been non-fiction and they were inspired by my views and experience of businesses in general and then banking in particular, and how their inability to focus on people, behaviours and the right values have significantly impacted all of us. Morgen: I’ll be interviewing Fred Lucas in a few days, the White House correspondent for CNSNews.com. I’ll have to point him to this interview. 🙂 What have you had published to-date? Do you write under a pseudonym? I love my name and it is already reasonably unique so I have never used a pseudonym. Morgen: It is, absolutely. There’s an author I really like called Michael Letwidge, co-author of some of James Patterson’s books, including the brilliant thriller ‘Step on a Crack’. You’ve self-published, what lead to you going your own way? Jonathan: When I tried getting a publisher for my first book I realised just how narrow-minded publishers are: They have very specific ideas of what material they want to represent and how they wanted to present it. Since it appeared I could not fit into their expectations I decided to self-publish. I then tried a regular publisher for my second book and this time I was successful. However, I do not believe they did enough to market the book and I was disappointed. As such, with my last book, I am now back to self-publishing. Morgen: What a shame, although self-publishing works out really well, and the route I’ve chosen to go down. Are your books available as eBooks? Do you read eBooks or is it paper all the way? Jonathan: The eBook versions of my book are on the way. I have to confess that I have not converted to eBooks as yet in terms of my personal reading but I believe that it is only a matter of time. Morgen: <laughs> Most likely, and most authors I’ve spoken to have enjoyed the experience although almost all say they wouldn’t give up the printed book (nor would I). What are you working on at the moment / next? Jonathan: I only recently completed writing Clearing The Bull and I am working very hard to market it using my blog and social media. However, I am also trying to make some headway with the regular media and professional organisations. Morgen: I imagine the ‘regular’ outlets to be tougher, perhaps you’d like to write me a guest blog post on your experience. Do you manage to write every day? Do you ever suffer from writer’s block? Jonathan: Once I have started writing a book the passion devours me because I write from my heart as well as my head. So I just tend to keep going. However, when writing for my blog as I am now I do tend to get writer’s block on the odd day. Morgen: Oh dear. I’m fortunate that I have so many guests on my blog that I don’t have to think too much. 🙂 Do you do a lot of editing or do you find that as time goes on your writing is more fully-formed? Jonathan: I find the greatest thing about writing with passion is that you get taken into directions you never dreamed off when you started writing. When you are passionate about what you write you literally eat, sleep and drink it 24/7 and the ideas are constantly flowing. There are even times when you have to check the sanity of what you have written because you know that despite whatever research you have done, you would have never thought of writing such a thing. Consequently, I am always editing. Morgen: “eat, sleep and drink it 24/7” sounds very familiar. Do you have to do much research? Jonathan: I have never had to do a lot of research to write my books because I usually know and / or have been intimately involved with what I am writing about. However, when you write business and banking as I have done in my last two books you need to show references—thus my books do have a lot of footnotes and references. Morgen: It must be harder with non-fiction because everything has to be meticulous, and accurate. Do you have pieces of work that you think will never see light of day? Jonathan: So far no. Once I start writing I just keep going until I finish. However, I do have ideas which I have not written about as yet. Morgen: I think we all have. I’ve so many I’m not sure I’ll have time to write them all, even at one a day. 🙂 Have you had any rejections? If so, how do you deal with them? Jonathan: Plenty—but since I have always believed in myself and what I write, I have never allowed it to knock my confidence. Morgen: Bravo. 🙂 I like to think that it’s just the right thing for the wrong person. Do you enter any non-fiction competitions? Jonathan: This is an area I have failed to explore. Maybe I should. Morgen: Only if there’s something right for you and have something unpublished that you don’t mind disappearing into the ether for a while. I prefer themed competitions, but then I write fiction, as invariably it gets me writing something new. Do you have an agent? Do you think they’re vital to an author’s success? Jonathan: I do not have an agent. Hopefully, I will get to a stage where I will need one. I do believe that the best person to initiate the marketing of a book is the author. Morgen: So do I, and generally we’re expected to. How much marketing do you do? Jonathan: I have been focusing on marketing my book through my blog and social media, as well as through traditional print media. I view my books as being just a part of the whole philosophy of what I represent—which is basically a more enlightened approach to how we live, how we work and how we are governed. As such, I believe marketing what Jonathan Ledwidge is about is just as important as marketing individual books. Morgen: It is because unless you write a ‘Harry Potter’ or ‘Fifty Shades of Grey’, you’ll likely be knownyou’re your name. What’s your favourite / least favourite aspect of your writing life? Has anything surprised you? Jonathan: What has surprised me more than anything else is the way in which passion imposes itself upon and influences the imagination and creativity. It allows one to come up with ideas, make apparent that which was previously hidden, and string together bits of knowledge which previously appeared unconnected. This has to be my favourite part of writing. My least favourite part is trying to get either publishers or the mainstream media to publish my book / articles even when they agree that I am bringing them something that is fresh and different. Frustrating but that is the reality. Morgen: It is. And your answers mirror, I’d say, at least 75% of my other authors’ answers to that question, with some saying they get frustrated at how much time marketing takes because all they want to do it write. What advice would you give aspiring writers? Jonathan: The first thing I would say to aspiring writers is that it is important that you realise that the very first audience for your book is you. No matter what happens after you have written it, whether the sales are a million or only one, be sure to ensure that you are proud of your work and the genuine efforts that you put into it. The second thing I would say is to write with your heart as much as your head. It is only when we are truly passionate about something that our creativity and our artistry really come to the fore. Morgen: Hear, hear. 🙂 If you could invite three people from any era to dinner, who would you choose and what would you cook (or hide the takeaway containers)? Jonathan: This is a lovely question. Jonathan: I am hopeless at cooking so I would have to take them out to dinner at a restaurant. I would love to speak to Gandhi. Even when I watched the movie for the nth time recently I am still so amazed. I would really like to hear from him, how he could have remained so motivated to a cause all those years. I would also love to find out the secrets of how one wields power without holding any formal position whatsoever—that single fact alone was a big part of a remarkable story. Hopefully, I would discuss this over a curry somewhere around Brick Lane in London’s East End. I would love to speak to Bob Marley. Apart from the fact that I seriously love his music I am amazed that a man could sing about his own upbringings in the ghettos of Kingston but still have it resonate around the entire world. I believe that the answer to that can be summed up in one word; authenticity. Marley’s lyrics, emotions and music were so authentic that it captured his passion and attracted a global audience. It has motivated me such that I strive to ensure that my work reflects all the passion and authenticity I can muster. Naturally, I would take Marley to a Jamaican restaurant where we could eat rice ‘n peas and chicken. I love history so the third figure I would invite to dinner would be Count Otto von Bismarck. This remarkably man used a careful combination of war and diplomacy in order to create the German state in the latter part of the 19th century. I would love to know how such a brain is inspired to work. Dinner, would be his choice—perhaps bratwurst somewhere in Berlin. Morgen: I’d definitely agree with Bob Marley. I love his music. I think your choices would be really interesting. Is there a word, phrase or quote you like? Jonathan: Yes—and it is the wise line of Ralph Waldo Emerson. It is; “Be careful what you set your heart on, for it will surely be yours”. Morgen: Let’s hope so. Do you write fiction? If so, do you have a favourite of your books or characters? If any of your books were made into films, who would you have as the leading actor/s? Jonathan: I have written only one fictional work to date; A Mannequin for President. It was written because I believe that the behaviour and intellect (or lack thereof) of George Bush very clearly said to me that he was a mannequin president. The book then tells a fictional story, but one which is contained within both current and historical context, how and why such a thing could have come about. I am still hoping that it gets made into a movie. Jonathan: For my fictional work I started with the idea or the concept of a mannequin president and then started filling in the characters and context around it. 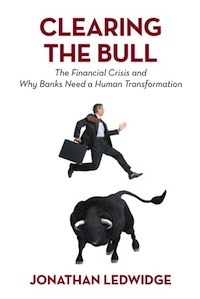 Jonathan: My last book, Clearing The Bull, was about the financial crisis and what banks needed to do to become more human and more sustainable. The book reflected amongst other things my more than twenty years of experience in the banking industry. To begin with I tried to exclude myself from the book by realised that so much of what I had to say was about my own personal experience. Eventually, I realised that I had to include myself in the first person. After the initial edit I realised that that approach was wholly justified. I wrote the book in order to ensure that it was accessible to all, bankers and non-bankers, and the reviewer told me that the first person experiences described in the book both authenticated it and helped to explain the issues. Morgen: It’s always validating to get feedback, positive or constructive. What do you do when you’re not writing? Jonathan: Working. My main job is still that of being a banker even though these days I tend to work on a contract basis. Morgen: I used to temp and much preferred it to a proper job, although I gave up my proper job in March and am at home full-time now and nothing beats that. 🙂 What do you think the future holds for a writer? Jonathan: The Internet, social media, blogs and eBooks have ensured that this is the age of the writer. In order to be noticed and relevant, writers have to ensure that they remain authentic and true to who they are. Remember, you are the only one like you out there. Morgen: With our unique ‘voices’. Where can we find out about you and your writing? Jonathan: My website is www.ledwidge.com and my blog is http://ledwidge.wordpress.com. We are often so trapped by our belief systems that we are unable to look beyond the confines of our own minds and see or comprehend greater possibilities. There are times when that can make us look foolish, as in the examples above. However, there are other times when it can be downright dangerous—as the French were to find out during World War II. In 1940, the French awaited the expected German invasion behind the Maginot Line—a series of reinforced concrete bunkers and forts along the Franco–German border, which they considered impregnable. They had left the border along the forest of the Ardennes only lightly guarded, believing that no army could possibly get through. History records that the Germans did get through the Ardennes and the Battle of France was lost in weeks. The above illustrates how false beliefs, especially those that have been held for a long time, can be a source of great weakness and may affect our very survival. When Japanese companies were making serious inroads into the US auto market in the 1980s, Detroit manufacturers believed that everything could be explained by automation and robots on the production line. So Detroit automated like crazy and they still couldn’t catch up. They failed because their belief system didn’t allow them to comprehend that their production inadequacies were human, not robotic. They stayed lost for a long time, as they were unable to break out of their belief system. Banks face a similar dilemma right now. Exacerbating the problem is the fact that the belief system and echo chamber in which they have found themselves is not entirely of their own making—they have company. Not only do they have company, they have the kind of company—regulators, central bankers, and governments—that, by an objective assessment, should have been helping them to think outside the confines of their beliefs and challenge their thinking. How did this happen? How has this impacted banks and the sustainability of their operations? More specifically, in the context of this book, how has this contributed to financial crises of the past and how might it affect or bring about crises in the future? The financial crisis shows that the banking industry requires a transformation, as its business model and practices are no longer sustainable. Even so, such transformation cannot be made without Clearing the Bull—moving beyond old and tired orthodoxies in order to properly diagnose the problem. Drawing on more than twenty years of experience in banking, author Jonathan Ledwidge shows how the financial crisis exposed the industry’s poor system of values, leaving it mired in conflict with its human environment. Specifically, this includes how poor leadership, virtually unmanageable organizations, dysfunctional suppliers, infuriated customers, alienated employees, and dissatisfied communities all arise from the inability of banks to understand that values are more important than valuations. As a result there is now a total disconnect between banks and their human environment. That disconnect cannot be fully addressed by conventional solutions involving more regulations, more governance, and more controls. Banks have a very human problem, and thus by definition what they require is a human transformation. Clearing the Bull provides both a clear diagnosis as well as a detailed and comprehensive roadmap for the banking industry’s human transformation—and while doing so it remains totally engaging and accessible to bankers and non-bankers alike. Jonathan was born in London in June 1959 but grew up in Jamaica. He studied physics and chemistry at the University of the West Indies (UWI) before joining Price Waterhouse and completing his ACCA to become a Chartered Accountant. On leaving Price Waterhouse he worked for J Wray & Nephew, the sugar and rum manufacturer, as Group Head of Internal Audit. 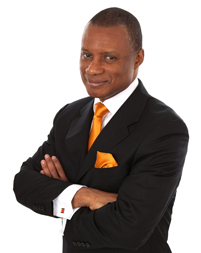 Returning to London in 1986, Jonathan earned an MBA from Cass Business School and worked for a number of banks in the City, including Continental, CIBC and ABN AMRO. Post ABN AMRO he has been engaged as an audit and business controls consultant for a number of investment banking organisations and has also been developing human asset strategies, the aim of the latter being to improve the economic and competitive sustainability of organisations. Jonathan has a passion for people, politics, history and culture, loves reggae music, enjoys movies, has a special bond with West Indian cricket and Jamaican athletics, and is a fan of Liverpool FC. He also loves travelling and meeting people from different cultures and perspectives. In that regard he considers meeting Fidel Castro in Havana in 1979 as one of the more interesting events in his life.